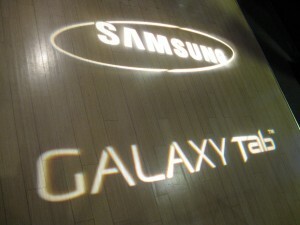 Last night the skies opened as I emerged from the subway on my way to Columbus Circle and the Samsung unveiling of their Galaxy Tab™. 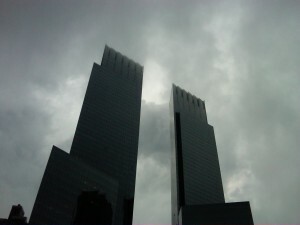 I was only a few blocks from the Time Warner Center and the rain was coming down strongly with thunder and lightening bursting over the Manhattan sky scrapers. What did this portend? Was this the operatic opening of a HUGE announcement at Samsung? I sure hope so and grateful for my umbrella! By the time I arrived it had stopped raining. For those who have never been in the Samsung Experience in the Time Warner building it’s spacious, clean and full of cool neato devices. 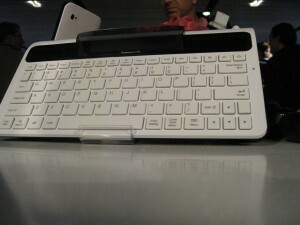 So, you Know your reporter was in gadget heaven. 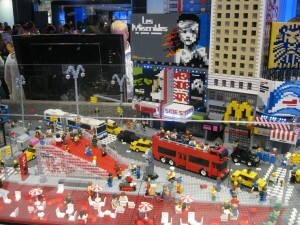 Aside from a stage area they have a lego display of what I assume is Times Square. Very cute! While we waited for the presentation to begin I tried counting how many members of the Digital Fourth Estate were in attendance and I’m sure it was easily one Hundred. Oh, yes! This WAS a big deal. 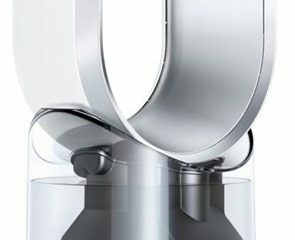 Then Dale Sohn the president of Samsung and various other speakers introduced the launching of three elements. First, the Samsung Galaxy Tab™. 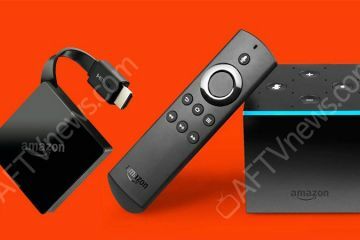 Second, the media hub accessing media service and third the Samsung website stressing that each of these developments had been extensively researched using consumer feedback. 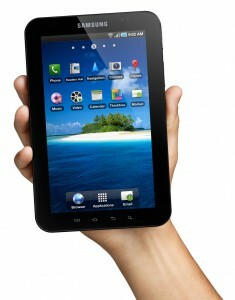 All four major providers – AT&T, Sprint, T-Mobile and Verizon Wireless – will be launching their versions of the Galaxy Tab™. So stay tunned for the details because each provider is expected to have this sometime ready for the Christmas season. The first mobile tablet from Samsung shares many of the powerful characteristics of the Galaxy S smart phone lineup that launched this summer. 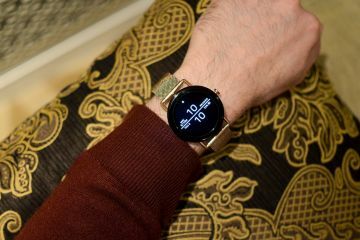 At 7″ it’s the perfect size. Like a book. Remember those? Paper pages with printed words all over the place? The Galaxy Tab™ may not have that lovely New Book smell but it does have TFT display screen (1024×600 res), 1GHz Hummingbird Application processor supporting 3D graphics. 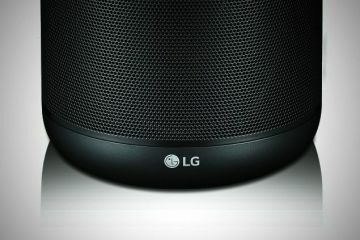 The OS is the Android 2.2™, including full support for Adobe® Flash® Player 10.1 using 3G and WiFi. There’s 16 GB of internal memory and up to seven hours of video playback using the 4,000 mAh battery. The Galaxy Tab fits in a pocket or purse, weighs only 13 ounces and is 12 millimeters thin. The compact design of Galaxy Tab also makes it easy for the user to type on the virtual keyboard with both thumbs or with one hand using Swype technology to type with one continuous finger motion across the keyboard. There are 80,000 applications currently available on the Android Market™. Many of the built-in productivity services and Android applications are scalable to fit the Galaxy Tab’s full 7-inch screen. 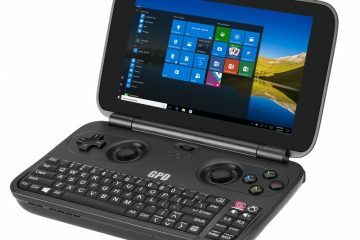 For example, the user’s email, calendar and contacts will all rotate from portrait to landscape format through the tablet’s accelerometer and then open as a split-screen to create a PC or laptop viewing experience on the Tab. Likewise, many Android Market applications will open in full screen. 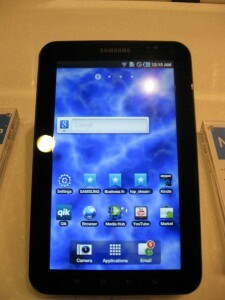 Non-scalable Android Market applications will be framed and centered on the Galaxy Tab screen. 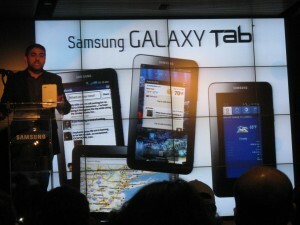 During the presentation we saw a live video chat using the Galaxy Tab™. Chat only works over WiFi and uses the front-facing 1.3 megapixel camera and camcorder. The rear-facing 3 megapixel camera is for taking pictures in the usual manner. Consumers can align the Galaxy Tab with video chat clients including Qik and Fring. While the keyboard was on display I tried to feel the action on the keys. I found them to be soft with a firm rubbery resistance. I much prefer that to the harsh click of other keyboards. Plus, they are a beautiful clean white design. Media Hub is Samsung’s own content service is which customers can share media content with up to five registered devices. That includes the Galaxy Tab™ and your HDTV – anything that carries the Media Hub application. Samsung is working with the biggest and best names in entertainment, including MTV Networks, NBC Universal and Paramount to assemble a robust library of movies and TV programming, including new release films, next day TV episodes and even full TV show seasons. This content can be for rent or purchase. 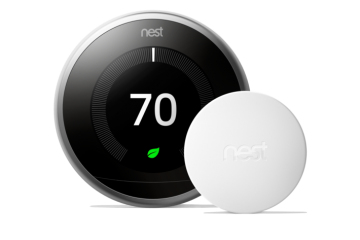 You would have to download for each device – and this is instantaneous, meaning you view it immediately. The new site is driven largely by consumer-generated content – including consumer contributed images and videos, Q&As on products and topics, as well as giving visitors the ability to comment on credible third party reviews and articles, share content on their social media networks and hear from respected bloggers and social media advocates. 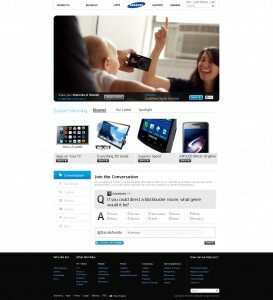 It’s like Samsung has added Social Networking to their product site. Well, not just a simple ADD but a full integration so that consumers make the content as well as find the information they need to make informed purchases. Samsung’s new digital platform which houses the world’s first TV app store – where consumers can browse and purchase more than 80 apps currently available for their Samsung TVs. 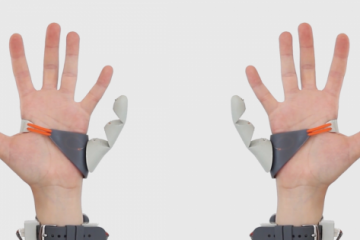 In this year-long initiative, Samsung took an unconventional approach to building and designing the company’s new site, bringing the former CEO of Razorfish, Craig Kanarick and former CEO of Agency.com, Chan Suh on to the development team immersing them in the brand and helping set an agenda for digital innovation. With the official launch of Samsung.com, the company is aiming to start a two-way conversation that engages visitors and provides them with a brand experience in addition to the Samsung product portfolio. “With Samsung’s new digital platform we wanted to engage consumers in a meaningful way that would support how they interact with one another online and with our brand,” said Kris Narayanan, VP of Digital Marketing at Samsung Electronics America. “The site is not a singular investment for Samsung, but the foundation for ongoing digital initiatives and businesses that aim to benefit our consumers and the online conversations they are receptive to, well into the future.”This change aims to enhance how people interact with the brand and the way Samsung interacts with them. While this digital platform is the first milestone of the significant shift in Samsung’s approach to the company’s digital future there will be exciting features and additions on the website leading up to the holidays. Queens may have had a Tornado blowing in but Samsung brought it’s own Storm Front to blow away the competition.